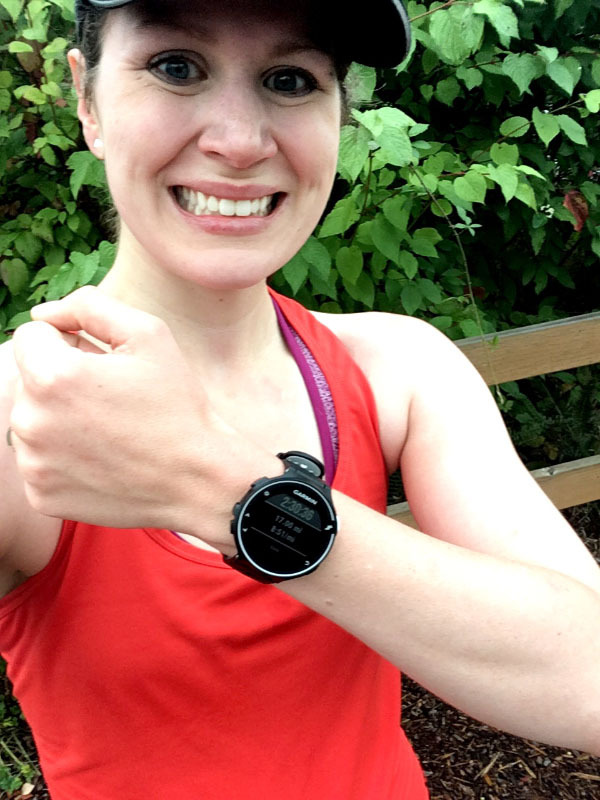 The subtitle of this week’s training recap would be “adaptive self-coaching.” I had a week of workouts laid out well in advance, but once the week started I adjust based on the weather, areas of training I felt needed attention, and how I felt. Originally, I had quarter mile hill repeats on the docket for Monday. One step outside into a world of puddles, pouring rain, and gusting winds made me reconsider. Running fast uphill on slick sidewalks just didn’t sound like a good idea to me. So, I decided to throw a fartlek there and run along my rolling hills route (which is mostly paved with asphalt and thus is less slippery in rain). After a 1.5 mile warm up, I alternated two minutes hard with five minutes easy for the remaining 7.5 miles. The pace of the hard intervals varied from 6:53-7:40, depending on whether I was running on flat ground or uphill. The rain stopped midway through, although the wind did not relent. Overall, this was a fun run and got in some sneaky quality speed work and hill training. For my strength workout, I did hamstring ball curls, single leg deadlifts with the kettlebell, Russian twists, pushups, and jump squats. Short, simple, and effective! I did a magic circle for athletes workout from Pilatesology. This workout focused on strengthening commonly weak areas for athletes – glutes, hamstring, and hips – while stretching tight areas. The magic circle increases the amount of work done using the shoulders and upper back, making this a well-rounded and hard Pilates workout. I learned that Ollie thinks that Pilates means I want to play with him, which means in the future he’ll probably have some practice crate time (he loves his crate) while I do Pilates at home. He kept leaning against me during the workout, which is how he initiates play and shows affection. I’m starting to think that 8:05 min/miles are an appropriate goal pace for CIM, but I know I need more practice running at that pace. I do really well in holding half marathon pace, but marathon pace is trickier for me to lock into. I delayed my mile repeats at 10K pace for a short marathon pace workout. The goal of this workout was more mental than anything: to practice holding that pace, especially over hills. Unfortunately, my hilly route also intersects with a few busy roads, which means starting and stopping at cross-walks. This doesn’t affect my run much, except it makes locking into a pace that much more challenging. As cliche as it sounds, I adore fall running. The crunchy leaves underfoot, the colors, and the fourty degree temperatures are all perfect. And the fact that this will be the weather for most of my marathon training? Perfect. Sign me up for CIM every year! This was not the best run. Pace-wise and effort-wise, I did fine, but a combination of slight dehydration and an almost empty stomach did not do my GI system any favors. Ugh. We all have those runs and know how they go. But at least I got my miles in and there’s no reason to be upset about that. Friday’s long run was my longest training run yet. 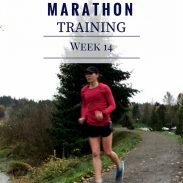 Since I followed the Hansons Marathon Method for my first marathon, my long runs had maxed at 16 miles. Like most long runs, this run had tough miles but also quite a few good miles, and I finished feeling good. The paces on my long runs are promising for a good marathon time. I focus on keeping a comfortable, easy effort and average about an 8:50-8:55/mile pace on my long runs. I honestly was a bit nervous about how this run would go and I’m happy to see how well these long runs are going. Plus: long runs in cool temperatures are the best. For Ryan’s birthday on Saturday, we celebrated by going to the Kirkland Oktoberfest. We both love Oktoberfests! The festival was on the waterfront of Lake Washington, which made it even better. I love the Eastside of Seattle. Ollie’s first full run! Ryan took Ollie on a two one-mile runs throughout the week to see if he was ready for a full run. Since Ollie is a year old, his body is developed enough to start running. 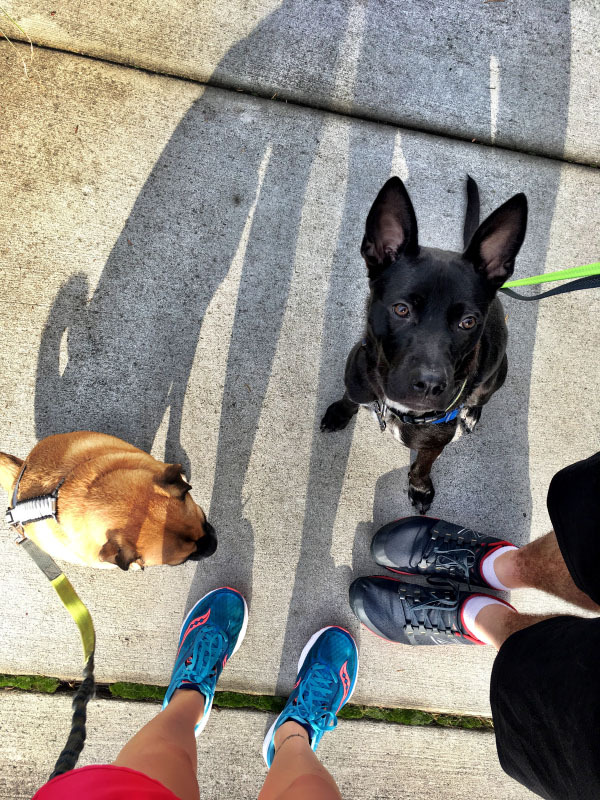 We ran 4 miles on our favorite route and both dogs did well. Ollie is a natural runner and Charlie thrives on the competition of trying to keep up. We took Ollie on his first hike! 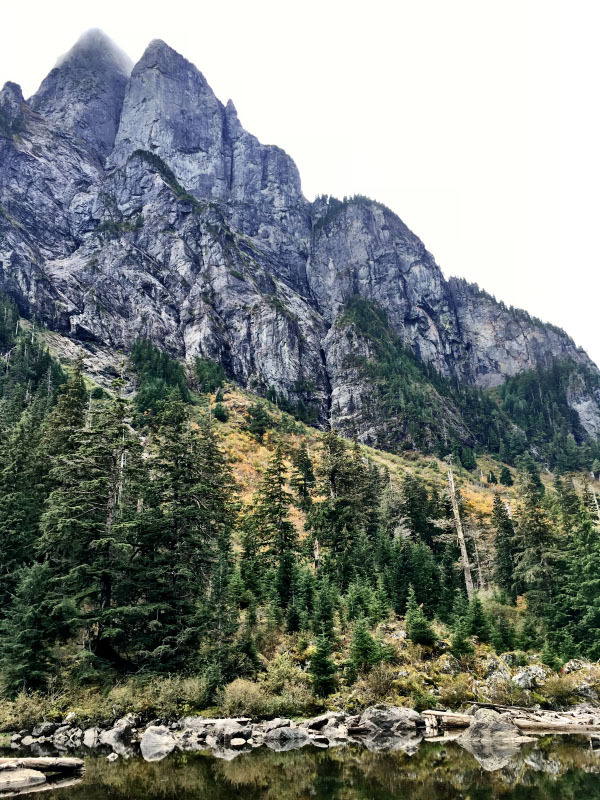 Ryan, Charlie, Ollie, and I hiked to Barclay Lake, which is a short hike with gentle incline that we had done a few times before. The fall foliage was beautiful! Ollie was a bit unsure of parts of the hike, but he enjoyed it and overall did well. At the top, we let Ollie and Charlie run loose and play. They’re still getting used to each other (well, Ollie already loves Charlie but Charlie needs time to warm up) and outdoor play helps them bond. I have some exciting news to share with you: I am now a contributor for Salty Running! I’ll be sharing my training logs there as well, along with articles and op-eds. My first article will be up this week. Has fall weather arrived where you live? Adapting your runs to the conditions and how you are feeling is smart. So many of us think we NEED to do a workout no matter what because it’s on the plan. Glad to see the doggies are getting along and having fun! Thank you! 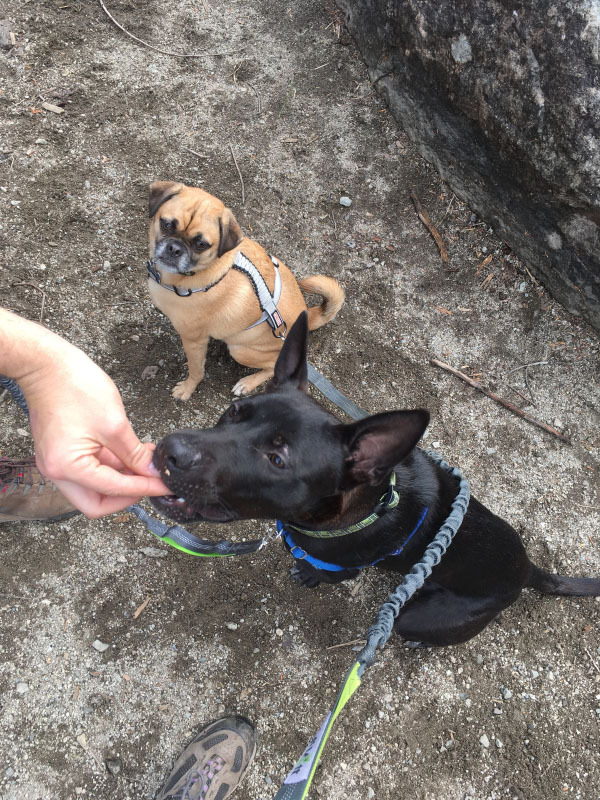 It’s definitely hard for me to break away from that need to follow a plan to a t. And the doggies are having so much fun – they both love their outdoor time! so fall is starting to kick in but not really. it’s in the 60s/70s but still feels cooler than it has been! you had a great week of running, that’s an great long run you got in! That’s like summer weather out here! Thank you! Fall weather hasn’t arrived here, but the humidity Saturday morning was only 94%. My last race it was 100%, in August. Does this count? Thank you! I can’t imagine the humidity you train in! There’s a lot of mornings around here with humidity in the 85-90% range and that’s rough enough. What’s so funny is that the first time we had Kirkland beer at an apartment event here, Ryan and I thought it was a local brewery in Kirkland and didn’t realize that it was from Costco. Their beers are good though! What marathon plan are you following? Probably a Franken-plan of Pfitz and Hansons. I want a run over 16 in there, and I’m not a fan of how you have 3 double-digit runs some weeks when you do Hansons. Thank you! Oh that’s so exciting that you read Salty also! 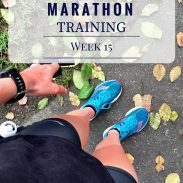 I love their marathon posts and honest discussion on things like Oiselle, the Olympic, and more. My Salty name is Fenugreek. See you soon! GO OLLIE GO! And congrats on Salty Running! Thank you! That’s the benefit of being a coach, right? Thank you! Marathon training is definitely tiring, I’ve been falling asleep earlier at night. I hope you enjoy that beautiful weather for a while! Aww, I visited kirkland once! Saturday was our first “cooler” temps here on the East coast. Because of that it was the best run i’ve had all year. Thank you! Yay for cooler temperatures in your area and great runs! And isn’t Kirkland so adorable? I love how it’s right on the water. Congrats on the Salty running contribution thing! That’s awesome! And wtg on that long run. Woohoo! I love Fall too except I hate it when people hide their dog poo under the leaves. It’s the WORST. Did you have sausage at Oktoberfest? I’m sure you did, you naughty little thing. Thank you! Ew it’s so gross when there’s hidden dog poo. I love German food so of course I had a brat..and sauerkraut, and a pretzel, and beer! Sounds like a solid week. And yes, adapting your running to how you feel is so smart. I always try to run comfortably (esp during the long miles), so I don’t burn out too early. 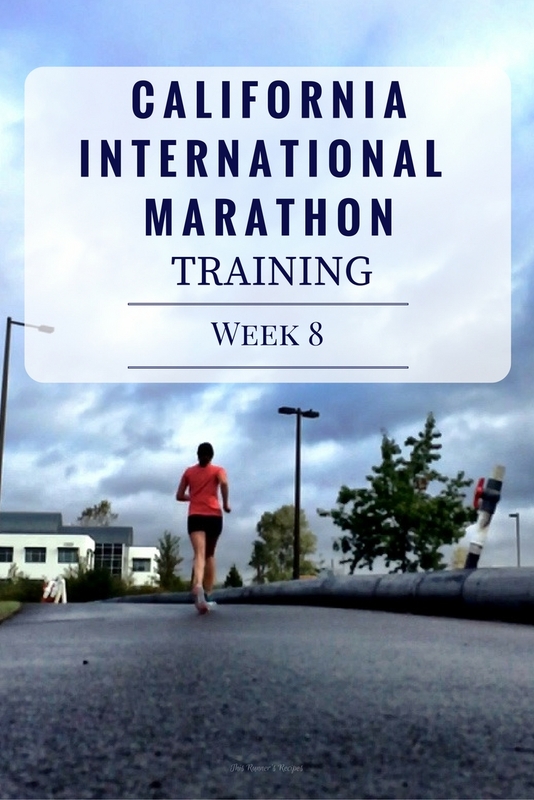 My training was so-so… I had a good interval day, but the long run this weekend was a struggle. Oh well. Onwards and upwards. Thank you! I agree, keeping those long runs comfortable is key to feeling good throughout training. 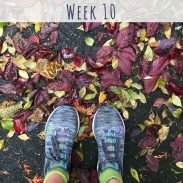 Although there are weeks where a long run is just a struggle. I hope your training this week goes well! I am still anxiously awaiting cooler Fall temps. I love the crunchy leaves under my feet. But that also means acorns and green, unripened pecans (which can turn an ankle!). I change up my planned runs based on the weather. If I wasn’t coaching myself, I might stick with the plan? Actually, I don’t know. Ha. Ollie is so cute. It sounds like he is adapting to his new environment very well. I’m sure Charlie will come around and they will be best buds in no time. Thanks for linking, Laura! Thank you! Ollie is doing very well and adapting more each day – such a sweet and smart boy! Thank you for hosting! Thank you!! 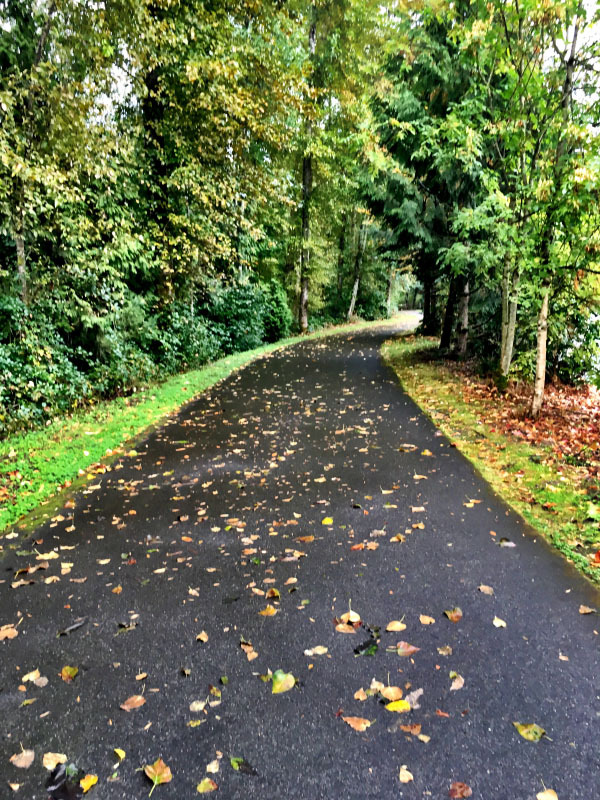 It is spoiling to run out here – but I’m excited to run in Vermont! Fall is my favorite time to run too and I love crunching leaves! I guess it takes me back to my childhood when my dad actually raked the yard. He’d have it all in a nice neat pile and I’d run and jump in it! Your setting yourself up for a great race with those paces Laura! Thanks for joining us in the link up!